The characterisation of parts and devices in the Registry of Standard Biological Parts have have been considered in terms of rate of gene expression in the units Polymerase per Second (PoPS) or Ribosome per Second (RiPS). However the characterisation of the chassis housing the expression machinery has not been considered up till now. Here, our team has identified several parameters that will help us understand the advantages and disadvantages associated with gene expression in a particular chassis. Rise time - Measure of time from start of reaction to the point when expression first reaches the steady state value. Peak time - Measure of time from start of reaction to the point when expression reaches the maximum value. Settling time - Measure of time from start of reaction to the point when expression reaches the steady state and does not escape from it for a prolonged period of time. Stability of synthesized protein - Measure of the half-life of a given protein (e.g. GFP) in the chassis. 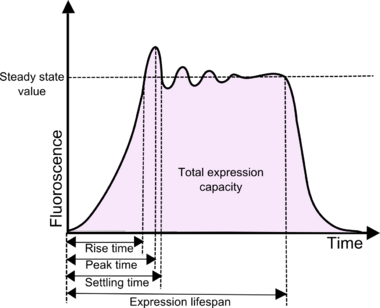 Total expression capacity - Measure of the total expression of a chassis for a given construct. This should take into account the degradation of synthesized protein. 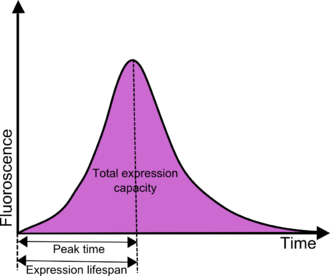 Expression lifespan - Measure of time that expression occurs for a given construct until protein degradation overrides protein synthesis. Chassis lifespan - Measure of time that chassis is stable without gene expression. This should be measured at optimum conditions (e.g. temperature, pH) of storage for the chassis. Reproducibility - Measure of standard deviation of the measurements above. This shows how reliable the system is to give a standard response. Cost - An indication of the cost of chassis required per unit of expression. This page was last edited on 27 September 2007, at 14:01.